Maybe you are a hard-core dedicated runner who spends much of their time out running on the road, whether performing fast-paced sprints or long, slow distances, as means of preparing for the next big competition coming your way. With all of the amount of exercise you do to get into shape, it comes as no surprise that every piece of equipment you wear (e.g. running shoes, shorts, etc.) makes a huge difference to your athletic success. That said, all seems to be going well…until you start feeling a sort of slight, sharp pain in your knee whenever you walk or even run. You are not sure just what is going on, but little do you know that you most likely have a runner’s knee, or patello-femoral pain syndrome, which if not healed properly can lead to chronic pain over the long run. Sounds depressing, but what can you do about it? All is not lost, though: we are here to help! Read on to learn more about how to go about running, even with bad knees. As a rule of thumb, a good pair of running shoes can help. We will give you tips and tricks on how to find the best running shoes for bad knees, so that you can continue to do your passion with minimal pain. By taking good care of them, too, you can be sure to heal in no time. An acronym for “rest, ice, compress, elevate,” R.I.C.E. is the most common thing that runners do to treat a bad knee, at least temporarily. Especially if the area starts to act up, icing it can help reduce the swelling. The trick is not to put the ice on for too long (i.e. over 20 minutes), since it can actually do more harm than good. Products such as ibuprofen are good over-the-counter pills to take if your knee is really acting up. You can find them in just about any drugstore. The key is to take it in moderation; after all, you would not want to overdose on them! Not just with ice, but also with bandage wraps and compression sleeves. They constrict the knee and increase circulation to keep the area loose and less prone to injury. This refers to both stretches and weights. A combination of weak hips and joints cause many knee injuries, along with inflexibility. Hence, by doing weight training for your hips, hamstrings, and quadriceps, as well as stretching them out afterwards can make a difference over time. Under extreme circumstances would it benefit to talk with your doctor about physical therapy, let alone surgery, to get rid of the pain. It is necessary to get a diagnosis before anything happens, so that you can be ensured for a smooth, effective recovery. Another tip to eliminate bad knees is by having proper running shoes. Especially if you have been wearing the same pair for a long time and they are showing signs of wearing down, then it is necessary to change them out to ensure that you do not develop problems when running later down the line. For those who have low arches (i.e. “flat feet”), they have the tendency to over-pronate, or the inward rolling of the heel to the toe. Runners who are flat-footed roll in excessively, which then puts pressure on the knees; over time, it can lead to injury. If you tend to be an over-pronator, then finding running shoes that offer motion control is the way to go, so that you are less likely to roll inwards later. On the other hand, supination is the outward rolling of the foot, so that it causes pain on the inside of the knee. Although a rarer condition than over-pronation, supination nevertheless can be just as painful and annoying to deal with. For those who supinate while running, it is not advisable to get stability shoes, since they can actually exaggerate the outward rolling motion. Instead, running shoes that provide cushioning and flexibility are the way to go, since they can actually relax the area and offer your feet more room to correct themselves for the next run. Usually, people with a neutral running gait tend to have less problems and are less likely to develop knee problems. However, this is not to say that they still do not get knee injuries- in fact, they do! As a rule of thumb when it comes to buying neutral running shoes, it is all about balance. Look for pairs which offer stability, but are not “motion control,” since you will still need some flexibility to run effectively and safely. In addition, a bit of cushioning does not hurt, especially if you tend to go out uneven terrain. Granted, you might need to try on several different pairs before you find the best one, but it will be worth it in the end. Sometimes, it is a matter of arch support, of which your running shoe’s built-in arches might not be enough for. You will need to consider if orthotics is necessary for extra support, and go about getting one. Our article on orthotics can help you get started. With excellent features, such as FluidFit and FluidRide for a well-fitted form and a bounce-back mechanism, respectively, ASICS’ Gel-Kayano 22 running shoe is sure to help your knees, as well as your feet, feel comfortable and supported with each step you take. Its flexible performance will be sure to enhance your gait, for a more efficient running form. Has FluidFit and FluidRide features for a well-fitted shoe and a bounce-back mechanism, respectively. Has an Impact Guidance System for gait control and enhancement. Contains a measured shaft from the Low Top arch for better support. Flex point of the foot might not be ideal, depending on your shoe size. I have been wearing ASICS’ Gel-Kayano 22 running shoe for a while, and so far, so good. The Fluid features are excellent in helping me bounce back and push off from the ground with ease. The gait control feature is a plus, too. My only gripe is that the flex point is a bit too much, to the point that my arch aches after wearing the shoe for a long time. With mesh and rubber sole features, Brooks’ Beast 14 running shoe is traditional in concept, but still effective in giving you a breathable, supportive shoe to be able to run in without any sweat, literally! Not only that, but also they provide excellent arch support for those with weak arches, able to correct the problem in that way. Contains mesh and rubber sole features for a simple, effective running shoe. Offers great arch support, especially for those with weak, collapsing arches. Able to heal plantar fasciitis and other running-induced injuries. Not very durable, can break down within a month or two. I tried out Brooks’ Beast 14 running shoe not too long ago, and I must say that it is quite impressive. Although it is simple in its mesh and rubber sole design, I have had no problem with comfort and breathability when wearing them, as well as having better arches than before from its amazing arch support system. Only problem is that it is not long-lasting: within a month, the material started to break down. Mizuno’s Wave Inspire 12 running shoe takes in great detail when it comes to designing some of the best running shoes out there. For instance, it contains both a breathable upper mesh and a strobel board, which helps air out potential foot odor and keeps your underfoot well-cushioned, respectively. Its Double Fan Wave Technology helps keep your feet flexible, as well as odorless, so that you have less of a chance to develop injuries. Has a strobel board for a cushioned underfoot. Contains a Double Fan Wave Technology for a flexible, odorless running experience. Has a 12-millimeter heel-to-toe drop for pronators. Can have arch inconsistencies from one shoe to the other. I thought that Mizuno’s Wave Inspire 12 running shoe was really effective, in that not only it had an excellent air ventilation system, but also a cushioned underfoot to keep the soles comfortable while running. The 12-millimeter heel-to-toe drop was good for helping support my bad knees, too. While some people might be put off by the arch inconsistencies between shoes, I actually found it to be advantageous, since my left foot has a different arching point than my right. In the end, it worked out. Salomon’s XR Mission running shoe is hefty and sturdy, while also making for a smooth transition from road to trail within seconds. That said, if you tend to run on uneven surfaces, then this running shoe is right for you! Aesthetic-wise, they are not bad to look at, so that you can run not only effectively, but also in style. Smooth transition from road to trail. Great for walking and running. Might not offer enough arch support and cushion. 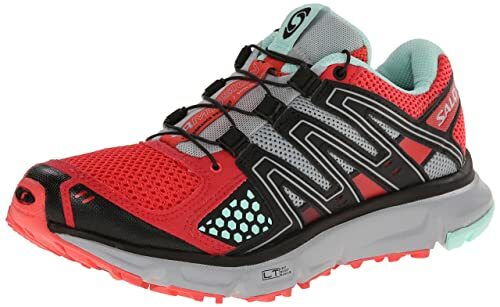 Salomon’s XR Mission running shoe was good in adjusting to just about any terrain I ran on, from concrete to trails to sand. It also kept up really nicely, despite all of the dirt and debris accumulated throughout my runs; so far, the pair is still clean! However, arch support and cushioning could be improved on, since I did not feel so comfortable with that. Consisting of an 8-millimeter heel-to-toe drop, Saucony’s Guide 8 running shoe offers some correction and support for runners with bad knees, as a means of motion control to realign their running form to a better, more efficient one. It is also lightweight, with a patterned mesh and no-sew overlays for a breathable and comfortable time. Arch support works with a 2.82-inch shaft, so that it fits to just about any arch type out there. Has an 8-millimeter heel-to-toe drop for motion control to help with bad knees. Is lightweight at 9.9 ounces. Contains arch support with a 2.82-inch shaft. Not very breathable, so upper mesh is not very effective. Saucony’s Guide 8 running shoe did a good job of correcting my running form with its 8-millimeter heel-to-toe drop. Not only that, but also I loved how lightweight it was; it felt like I was running on clouds! Only problem is that the patterned mesh does not control odor very well. Overall, the winner goes to Mizuno Men's Wave Inspire 12 Running Shoe (#3). Well-crafted with a penchant to detail, these running shoes provides an excellent heel-to-toe drop for motion control to help correct your knee alignment, and therefore any possible knee pain. Odor-control technology is on-point, as well as that of arches. It is worth the investment, and we encourage you to give it a go!